Mitch notched up his 250th parkrun on Saturday and Jackie completed her 50th parkrun. 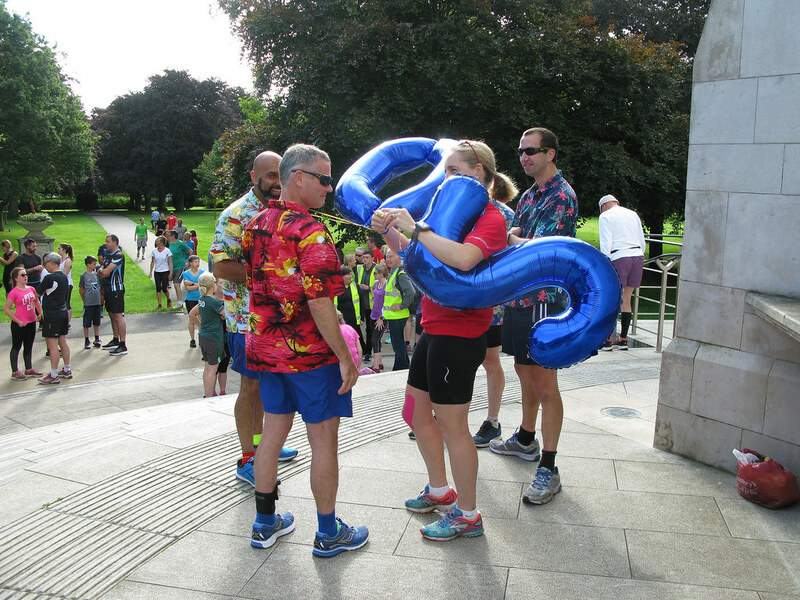 The celebrations (photos below) included Hawaiian shirts, balloons of varying number! and a conga finish. It was also Mitch’s 200th parkrun at Coventry and he almost finished in 250th position…almost. Also at Coventry. well done to Brian McSharry, Bobby Hartwell and Paul Gocher on PBs! Elsewhere, Barry Allen, Vicky Brewin and Rachael Allen joined in with Corby’s 200th parkrun celebrations, The Carvers were first-timers at Tamar Trails and well done to Alex Bartlett on a PB at Rushmoor. 29 Sphinx AC runners/family/friends ran this weekend, with no first-timers and 3 PBs. 28  Brian McSharry          20:24  JM11-14   72.88%   28  New PB! 48  Bobby Hartwell          21:32  VM45-49   65.87%   48  New PB! 121  Paul Gocher             24:22  VM45-49   60.05%  112  New PB! 22  Barry Allen    21:22  VM40-44   65.37%   21  First Timer! 124  Vicky Brewin   26:32  SW30-34   56.03%   22  First Timer! 148  Rachael Allen  27:53  VW35-39   54.27%   28  First Timer! 30  Louis Carver   26:41  JM10      61.27%   27  First Timer! 31  Stuart Carver  26:41  VM45-49   53.53%   28  First Timer! 26  Alex Bartlett  20:54  SM30-34   62.44%   24  New PB!